i-Build.PH Web Solutions and Services is looking for interested, skilled and dedicated students and working professionals who are in the field and industry of the creative arts, information technology, digital marketing, and online business and who are willing to gain invaluable and actual, hands-on work experiences as interns. We prefer those residing from and studying in any schools in Marikina or nearby Quezon City and Rizal areas. We officially started our internship program for both students and working professionals last 2016 and continuing on with providing knowledge transfer, skills-building and training until now. The internship has seen graduates of at least two (2) working professionals from related work and industry and three (3) graduating student interns for last year from Polytechnic University of the Philippines (PUP) who have gained invaluable skills and experiences on working on actual and hands-on projects. We have our first intern already for 2018 - a BSIT student from Pamantasan Ng Lungsod ng Marikina (PLM). We believe in quality, not numbers! 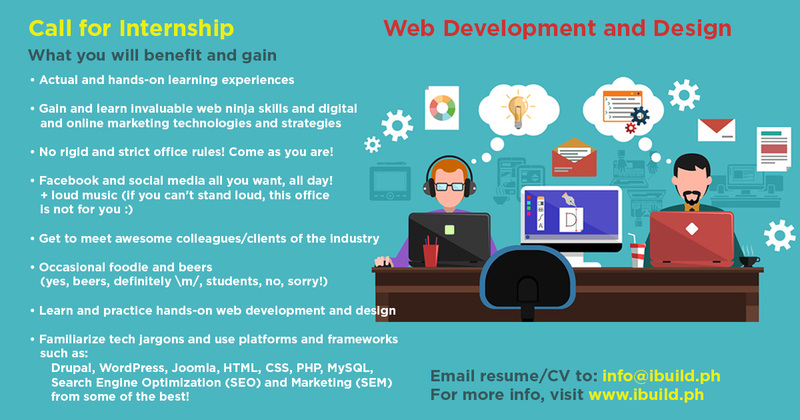 To guarantee the knowledge and experience you will learn and actually apply to hands-on and actual work and projects, we require at least minimum internship program of about 3 months or around 400 hours. Any related portfolio whether online, attached files, scanned documents, etc. What are you waiting for? Hurry now, as we only have very limited slots every time! We normally accommodate only a maximum of five (5) interns each time. No rigid and strict office rules! Come as you are! Drupal, WordPress, Joomla, HTML, CSS, PHP, MySQL, Search Engine Optimization (SEO) and Marketing (SEM) from some of the best!